“Want to come with us to Raglan for New Years?” Jenny, my couchsurf host, asked me after less than 24 hours into staying with her and her two roommates. A couple, Calle, a Swedish guy and Mahlia, a French Canadian girl, are roommates with Jenny who is from Massachusetts. All of them have been on working holiday here in New Zealand for several months. They live together in their 3-bedroom apartment in the city center of Wellington. I had just finished a week-long housesit in Karori where I hiked and played with a kiwi family’s puppy over the holidays. Now I was trying to figure out what I would do before heading to the South Island in the New Year. One night of playing Cards Against Humanity with these three roomies and we were quickly bonded. They reminded me of my friends back home. “Sure. I’d love to spend New Years with you guys.” I told Jenny. We left on Wednesday to make the 6+ hour drive up North to the West Coast beach town called Raglan. I had missed it on my previous two road trips around the North Island, but I heard it was a laid-back hippie town where surfers and skaters like to hang. We were just hoping the weather would hold out enough to camp, enjoy fireworks, and swim at the beach. After arranging the rental car, Jenny and I decided to take advantage of the sunshine and warmth the day before our trip. The weather report looked like rain for the entire North Island for New Years Eve. So we booked a couple of kayaks and took them out on the bay. I was eager for some physical activity and to get out on the water. I miss riding my jet ski back home and kayaking was an inexpensive alternative. We could hire a kayak for about $30 NZD each for 4 hours. The winds were going to be picking up later in the day so we decided to head out only as far as the lighthouse and back. Otherwise the waves could get too big for us to manage on our own. After all, this was “Windy Welly,” the capitol city known for its strong gusts off the southern shore. Everyone seemed to be enjoying the outdoors on this day. People were walking along the pier, hanging out at the beach, and there were many other kayakers, too. I couldn’t help but go under the huge fountain near the beach—the water raining down on me was refreshing after a couple of hours of paddling. When we made it back home, we still had most of the day to relax and get our bags together for the trip North. We picked up Mahlia at Noon from the café where she works with the car all packed and ready to go. Our route led up the West Coast. I stared out the window in awe of the huge waves crashing against the rocky shoreline. I had skipped this particular route on previous trips. The coast here was so different from the easy waves and sandy shores of the East Coast. Mahlia, Calle, and Jenny told me the South Island’s West Coast was similar, only even more beautiful. They all had toured around New Zealand quite a bit before settling into their jobs. They were getting me amped for my upcoming trip south. Soon we turned inland and cut between the Taranaki and Tongariro regions. Perpendicular to the Forgotten Highway on which I drove with Marek and Harald, the scenery around us was filled with the vibrant rolling green hills I had grown so accustomed to seeing around the North. I was starting to feel very familiar with New Zealand’s North Island. I’m ready to move southward after this trip, I thought to myself. We couldn’t help but stop for some “family photos” at one of the most beautiful spots on this stretch of road. The hills seemed to go on and on for days. We arrived at the campground just as the clouds unleashed the hardest rains I had yet experienced in New Zealand. There were hardly any spots left to put up our 2 tents—many locals and travelers had already laid claim. But we found possibly the last two spots available. The rain didn’t die down, so we put up our tents regardless of them getting wet. With no shelter to cook dinner, we stayed inside the car and ate what I had made for everyone the night before. Luckily there were leftovers appetizing enough to eat cold. My tent was big enough for the 4 of us to huddle under for the rest of the night. All we needed was Cards Against Humanity, champagne, and each other to make for a hilarious and fun-filled evening in spite of the weather. As midnight approached, the rain lightened to a drizzle and we heard the first bang of a firework in the distance. A little drunk, we all stumbled out of the tent to watch the time and the skyline. At 12, fireworks exploded from multiple directions and all the people on the campground began to cheer. We cheered and clinked glasses and I felt grateful to spend New Year’s Eve with three great people in New Zealand. The sun dried the rain on the outside of the tent almost instantly the next morning. It was going to be a hot day. We had breakfast up the road near the water. Someone had built a house nearby in the shape of a UFO! With satisfied bellies, we drove into the small town center to check things out—especially the park along the water. A bird followed us as we walked from the waterside all the way into town along the sidewalk! A popular coffee shop looked like a boat shed. Surf boards were decoration in empty spaces. People walked barefoot in board shorts with their dreadlocks swaying. This really is a hippie-surfer town, I thought. We spent half the day lounging at the beach. The beach was on an inlet blocking the rough waves of the ocean around the corner. The water was calmer here, but still cold. New Zealand’s oceans and waterways are typically cold, but people didn’t care on this hot, sunny summer day. People were enjoying the first day of 2015, playing on the playground, riding in the skate park, digging in the sand, cooking food on public barbeques, and jumping off the bridge into the canal. In town, we bought fish and chips and ice cream for lunch. Nom! Then we drove to the shore where the surfers play in the waves. Paddle surfers and regular surfers line up where the waves break, waiting for the right one to catch. They ride them into the rocky beach and then pick their way across the boulders back out to the lineup over and over again. We made dinner that night on picnic tables overlooking the waves. I felt at peace with these lovely people watching the sun setting behind the coastal hills. 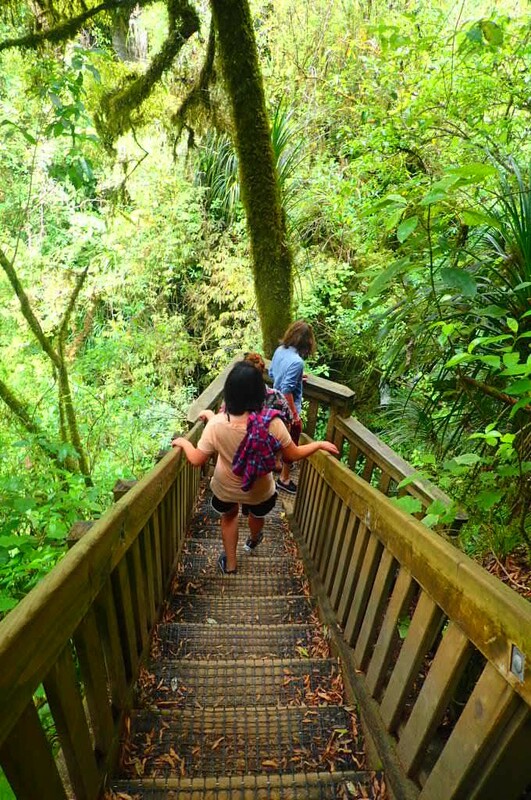 We had some time on the way back to Wellington for a stop at the Ruakuri Natural Tunnel. Near the Waitoma glow worm caves are these great cave systems created by powerful waterways. At one part, we could see where people ended their paid tour to tube through the cave systems. I saw them and thought how cool it would be to find a cave and go through it self-guided. Maybe on the South Island I could find a safe one to explore. We took a short hike which meandered over an awesome gorge, through limestone rock cutaways, and along sculptured cliffs. 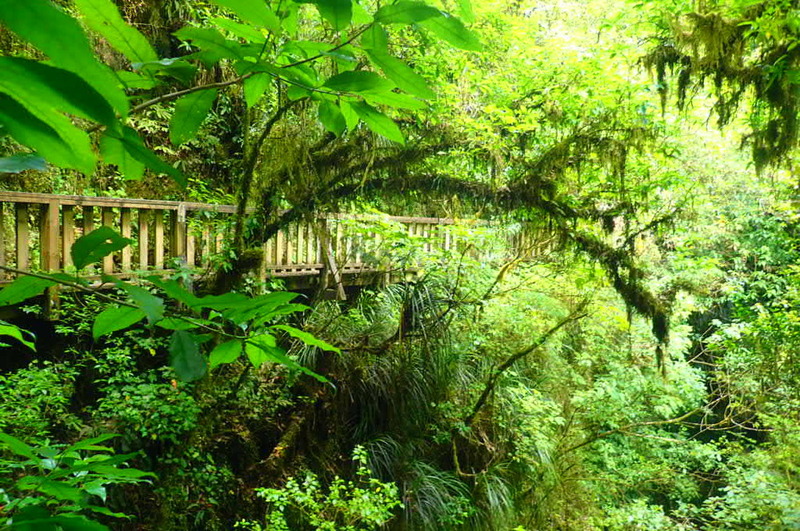 The walkways were built high along cliff ledges through the forest allowing us to see all of this and more. I had just a few hours when we got back to Wellington to gather my things. Instead of flying as many had suggested, I booked a ferry 3 hours across the ocean to the South Island. Like kayaking, it was another way to make up for the fact I was missing jet-skiing and generally being on the water. But I was also going to miss these new friends I had just made. Jenny, Calle, and Mahlia were sweet enough to invite me to spend New Years Eve with them even after knowing me only a short while. Despite being away from my friends and family back home, I ended up having a really fun and memorable few days with them. This made saying goodbye all the more difficult! Saying goodbye to new friends is how travel goes, though. I constantly meet new people and then have to part with them. While it can be a little sad, it’s also comforting knowing the good ones will stay in touch and you have the option to reconnect with them again—maybe even in a whole other part of the world! My adventures in the South Island will prove this very fact. First, I would need to make my way there and arrive at my next house sitting job on time. Stay tuned to learn about my adventures getting there!